For about 4 days now, there’s been some crazy hype on Reddit, following the news that Riot is currently testing and experimenting with reversing some permanent LoL bans. Now, we’ve seen this before happening in other games, such as Friday the 13th, where banned players were to be given another chance. This can be a pretty cool thing to try, and I really congratulate Riot for trying this, as even though some players might fall back into the same habits, a lot of them only made an honest mistake that they regret doing ever since. For the time being though, these permanent LoL bans reversal experiments are conducted on NA, on a very small scale of players. Based on them, and their results, this can see the light of day on larger scales and even in other regions. Which Permanent LoL Bans Will Get Overturned? To try and answer this question, let’s see what we know so far. Based on the NA trials and its players’, this entire permanent LoL bans reversal experiment can be conducted in other regions, or, if they fail the behavior test, it can be shut down altogether. Also, as I’m sure many of you wonder “why NA?”, well, their answer, and honestly quite a fair one, is that they chose NA for now, since it’s an experiment with limited staff and resources, which is also conducted from NA. This means that for the time being, it’s much more easier for Riot to investigate these NA player cases, given that there’s no language barrier as opposed to EU or other regions, and they have a much easier time actually monitoring everything. 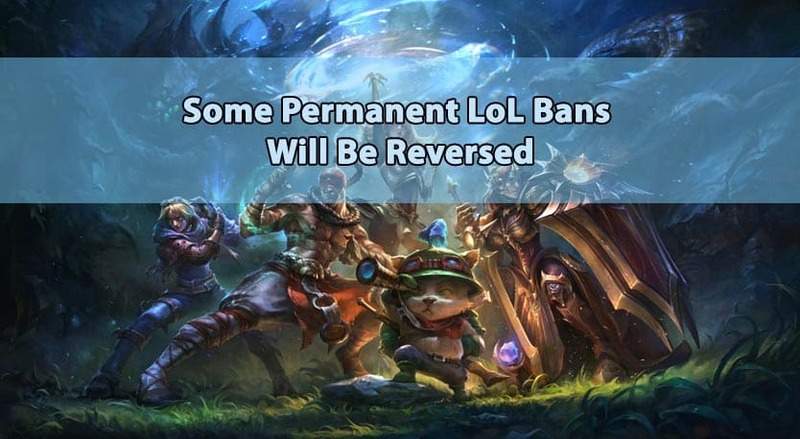 Until we hear more on this matter, let’s just hope the NA players selected for the permanent LoL bans removal experiment won’t make the same mistakes again, or otherwise break the rules in a different way. If they pass this test, according to Riot, this experiment can reach a larger number of players banned from LoL, from multiple other regions, not just NA. So, good luck to those that are currently part of it, and for the others, don’t hesitate to check out our LoL unban service! Need help with a LoL account ban? We're here to give you the best help in order to get your LoL account unbanned!